Our newsletter delivery application SamLogic MultiMailer is a desktop application and when the program needs to deliver e-mails (newsletters etc.) an e-mail server on the Internet must be used. The program has no built-in e-mail server (in the software) because these kind of servers have a very low delivery rate; anti-spam filters and other type of filters on the Internet find these kind of servers very suspicious nowadays. Instead you must use a well-known e-mail server on the Internet that anti-spam filters etc. recognize. Many Internet service providers (ISPs) have an e-mail server (SMTP server) that can be used for sending e-mails. Many of them can be used with SamLogic MultiMailer without any problem, but some of them have restrictions that make them hard to use when sending newsletters. They often have a limit of how many e-mails that can be delivered per hour or per day. Sending a few hundred e-mails in a day is normally no problem with these servers, but if you need to send many thousands of e-mail per day you will have a problem. If you have a newsletter that you want to send to your customers and you want to use a software like SamLogic MultiMailer for the delivery, there are e-mail services / relay services / general e-mail servers that can be used for this purpose. They have normally no built-in restrictions for the number of e-mails to deliver per hour or per day. The only restriction will be how fast the communication between the client computer and the e-mail server is. They have all a fast delivery rate and they can all handle e-mail bounces and log errors. Some of them have also advanced tracking systems and can track your outgoing messages and show information about them via detailed stats and graphs. These e-mail servers are well-known by anti-spam filters and have a good reputation. 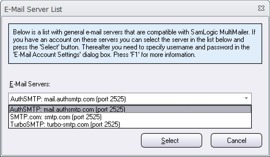 If you send large volumes of e-mails, AuthSMTP and SMTP.com can provide you with a static IP address. A static IP address gives you the option to generate a very good reputation for the source of your newsletters, and will increase the delivery rate if you maintain your e-mail addresses in the right way. It is easy to use the three e-mail services listed in this article with our newsletter software SamLogic MultiMailer. You only need to choose which e-mail service (e-mail server) you wish to use and enter username and password, and you can start sending newsletters with SamLogic MultiMailer immediately. For more details, view this video on YouTube. If you want to use another e-mail service that is not listed in this article it is also easy. You only need to specify the SMTP server, the port number, your username and your password. The port number is usually 2525, but check with the documentation of your e-mail service first. You don’t need to configure these settings in MultiMailer – it is done automatically. If you want to read more articles and tips about SMTP servers and related topics you can follow us on Facebook or Twitter, or subscribe on our newsletter. You can also read our blog. What is a Mail Server and How Does it Work?